Movie magic meets… popcorn science? No movie night is complete without delicious, buttery popcorn! But have you ever wondered what makes those kernels pop and jump? A study led by Ecole Polytechnic tried to explain this phenomenon. Two French researchers recorded high-speed videos and sounds as the corn kernels exploded. 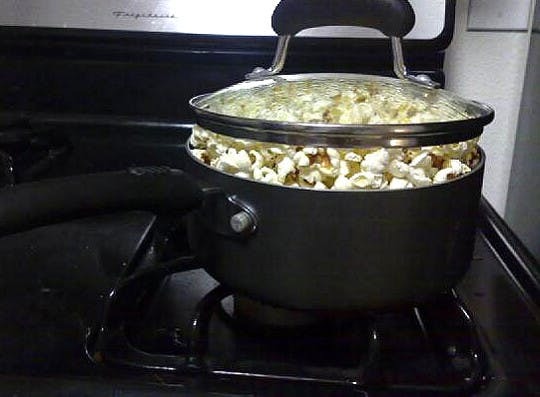 About four hundred kernels were individually heated until they popped. Their delicious findings? The perfect popping temperature is about three hundred sixty degrees Fahrenheit. That’s hot enough to make sure ALL of the kernels become our favorite fluffy snacks. Regardless of size and shape. Also turns out, watching popcorn pop is like watching a gymnast somersault. That’s because the heat inflates the tightly packed fluff inside the kernel until it explodes. This produces enough energy to spring the snack into a mid-air rotation. Quite elegant. And what about that familiar popping noise in the microwave? It comes from the pressure change inside an expanding kernel. Like popping a champagne bottle. So, next time you’re munching at the movies, appreciate the science behind the popcorn. And don’t forget extra butter!